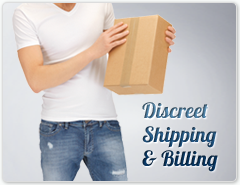 Orders at Aroma-Tek ship very fast and discreetly in a plain box. Many expedited orders ship the same day and ground orders will ship within 24 hours. Please see all of our shipping details below. Once you submit your order it is immediately sent for processing. During this processing time, your order is transmitted to one of our several fulfillment warehouses, safely packed, and processed for shipment as quickly as possible. Since orders are quickly sent for processing we are unable to make address changes or cancel orders. Please make sure to use the correct shipping address when placing your order. Free 2-3 Day shipping on all orders $50 or higher!! Two Day & Next Day orders placed by 11am PST. This excludes Saturday, Sunday and major holidays. Please note, processing and delivery times are not guaranteed. However, most orders are delivered within two business days, Monday-Saturday. Ground orders will usually arrive in 3-4 business days to most locations. Tracking numbers will be provided for every order at Aroma-Tek. You will receive tracking info via email the same day your order ships. If you register for an account with us you can also check the status of your order by logging into your account. Should you have any issues with tracking your package or delivery concerns please contact us for assistance.